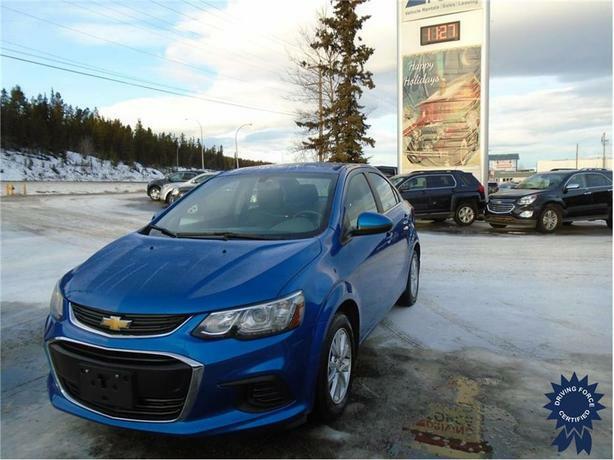 This 2017 Chevrolet Sonic LT 5 Passenger Front Wheel Drive Sedan comes with a 6-speed automatic transmission, 15-inch aluminum wheels, jet black/dark titanium deluxe cloth seats, kinetic blue metallic exterior color, Chevrolet MyLink Radio with 7-inch Diagonal Color Touch Screen, AM/FM stereo, oil pan heater, front mould splash guards, all-weather floor mats, 100-amp alternator, touring suspension, projector-type headlamps, Bluetooth hands-free calling, power door locks, remote keyless entry, remote vehicle starter system, smart device integration, rear-window electric defogger, tire pressure monitoring system, and WiFi hotspot. The 1.8-litre gas engine provides 138 horsepower at 6,300 RPM and 125 lb-ft of torque at 3,800 RPM. Touch base with us to discuss purchasing or financing options that are right for you and experience the difference you will only find at DRIVING FORCE Vehicle Rentals, Sales and Leasing.